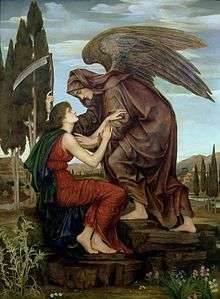 Azrael (Biblical Hebrew: עזראל‎‎) is often identified with the Angel of Death of the Hebrew Bible. The Hebrew name translates to "Help of God", "Help from God", or "One Whom God Helps". Azrael is the spelling of the Chambers Dictionary. The Qur'an refers to a Malak al-Maut ("Angel of Death") but it does not refer to him by the Judeo-Christian term. Islamic-Persian tradition adopts the name, in the Persian alphabet as عزرائیل ʿIzrāīl. Depending on the outlook and precepts of various religions in which he is a figure, Azrael may be portrayed as residing in the Third Heaven. In one of his forms, he has four faces and four thousand wings, and his whole body consists of eyes and tongues; the number thereof corresponds to the number of people inhabiting the Earth. He will be the last to die, recording and erasing, constantly in a large book the names of men at birth and death, respectively. In Jewish mysticism, he is commonly referred to as "Azriel" (Biblical Hebrew: עזריאל‎‎), not "Azrael". The Zohar, a holy book of the Jewish mystical tradition of Kabbalah, presents a positive depiction of Azriel. The Zohar says that Azriel receives the prayers of faithful people when they reach heaven, and also commands legions of heavenly angels. Accordingly, Azriel is associated with the South and is considered to be a high-ranking commander of God's angels. There is no reference to Azrael in the Bible, and he is not considered a canonical nor a non-canonical figure within Christianity. However, a story in 2 Esdras (a book disallowed by the Catholic and Protestant Churches, but considered canonical in Eastern Orthodox teachings) which is part of the Apocrypha, has the story of a scribe and judge named Ezra (not to be confused with the Biblical figure), also sometimes written "Azra" in different languages. Azra was visited by the Archangel Uriel and given a list of laws and punishments he was to adhere to and enforce as judge over his people. Azra was later recorded in the Apocrypha as having entered Heaven "without tasting death's taint". Depending on various religious views, it could be taken as Ezra ascending to angelic status. This would add the suffix "el" to his name, which denotes a heavenly being (e.g. Michael, Raphael, Uriel). Hence, it would be Ezrael/Azrael. Later books also state a scribe named Salathiel, who was quoted as saying, "I, Salathiel, who is also Ezra". Again, depending on certain views of Christian spirituality, this could be seen as angelic influence from Ezrael/Azrael on Salathiel, though this view of spirituality is neither confirmed nor denied by any popular denomination of Christians. In some cultures and sects, Azrael (also pronounced as ʿIzrāʾīl /Azriel) is the name referring to the Angel of Death by some Arabic speakers. The name is mentioned in a few Muslim books although some Muslims argue that it has no basis of reference. Along with Jibrīl, Mīkhā'īl, Isrāfīl and other angels, the Angel of Death is believed by Muslims to be one of the archangels. The Qur'an states that the angel of death takes the soul of every person and returns it to God. However, the Qur'an makes it clear that only God knows when and where each person will be taken by death. Several Muslim traditions recount meetings between the Angel of Death and the prophets, the most famous being a conversation between the Angel of Death and Moses. He watches over the dying, separates the soul from the body, and receives the spirits of the dead in Muslim belief. Rather than merely representing death personified, the Angel of Death is usually described in Islamic sources as subordinate to the will of God "with the most profound reverence". However, there is no reference within the Qur'an or any Islamic teachings giving the angel of death the name of Azrael. A story from Folk-lore of the Holy Land: Muslim, Christian and Jewish by J. E. Hanauer tells of a soldier with a gambling addiction avoiding Azrael. Because the soldier goes to Jesus and asks for help, then must later see Jesus and repent to be allowed back in Heaven; this story can be seen as a Christian account of Azrael. However, this story does not specify whether Azrael is an angel of death, or an angel of punishment. In Kevin Smith's 1999 film Dogma, Azrael (portrayed by Jason Lee) is the character pulling the strings behind the bulk of the plot, manipulating both protagonists and antagonists to quietly carry out the cast-down angels' revenge on God for the judgment she cast on Azrael. Azrael appears as one of The Four Horsemen of the Apocalypse in the novel Good Omens by Neil Gaiman and Terry Pratchett. Azrael appears in Melissa de la Cruz's book series Blue Bloods as a young woman named Madeleine "Mimi" Force. She is one of the Blue Bloods of the New York Coven, a community of fallen angels who fought on Lucifer's side in the War in Heaven and were subsequently punished by God by being cursed to live their immortal lives on Earth as vampires. In her angelic form, she is the Angel of Death, and, with her twin brother Benjamin "Jack" Force, also known as Abbadon, the Angel of Destruction, the two make up the Twin Angels of the Apocalypse, two of the oldest and most powerful of God's angels who are only inferior to the archangels. Wikimedia Commons has media related to Azrael.